In Edward Zwick's The Siege, New York City becomes the target of several terrorist attacks after the U.S. military captures a Muslim leader. Government officials try to contain the escalating madness, but when it spirals out of control, martial law is declared. $13.931 million on 2541 screens. Back when I originally reviewed 1998’s The Siege in 2000, I noted that it was remarkable that the US had been largely unaffected by terrorism on our shores. Obviously that situation changed radically in September 2001, and those circumstances make the movie even more charged today than it was 11 years ago. The result is a tight and tense thriller that manages to fit in some thought-provoking material about the price of freedom. 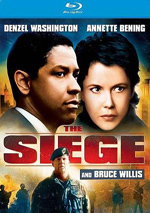 The Siege looks at the issue mainly from the point of view of Anthony Hubbard (Denzel Washington), and FBI agent who slowly finds himself engulfed in greater and greater turmoil with little apparent resolution. With the sporadic help of a mysterious and shifty CIA agent (Annette Bening), “Hub” pursues various leads to track down and eliminate the various “cells” of this Arab-run campaign, but the situation leaves his control when the President orders martial law to take effect in New York. 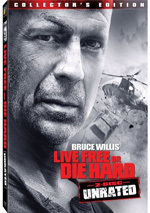 At that point, General William Devereaux (Bruce Willis) brings in the troops, and the issues related to freedom become more prominent. Essentially the movie discusses at what point the public good allows for various excesses as we see Arab-Americans imprisoned and tortured for no reason other than their national background. Director Ed Zwick has covered similar issue-oriented topics in films like Courage Under Fire, and he neatly presents ideas without making the movie appear forced or preachy. While it also seems clear on which side of the fence Zwick’s sympathies lie, the story looks at the concerns in a relatively fair manner; all viewpoints are presented and while one takes priority, the tale still relates the others in an acceptably objective way. In other words, The Siege doesn’t promote easy answers, as there would be none in this kind of situation. Mostly the story debates whether or not the end justifies the means. This leads to some of Washington’s best scenes as he stands in defense of freedom and the notions upon which the US was built. At one point he delivers a speech on the topic; while this text probably looked stiff on the printed page, Washington brings it to life. Heck, I was tempted to stand and cheer when I first heard this during the film’s theatrical run! Washington is almost uniformly a strong actor, and he presents another solid performance here. He lends the role a wonderful sense of authority and presence that makes it work. Actually, the entire cast provides fine acting. Willis is a little too hawkish as Devereaux, but he never descends into truly cartoony work. Bening seems deft and appropriately evasive as the CIA agent, and I’m always delighted to see Tony Shalhoub, who plays a fellow FBI agent and Hub’s best friend. Shalhoub is very able to straddle the comic and dramatic aspects of his role; even during some serious moments, he can inject a little levity that appears perfectly natural and appropriate. Yeah, I’m in the bag for Shalhoub, but this is still one of his better performances. Six degrees of Kevin Bacon time: at one point in The Siege, a character mentions the “BQE”. That’s the “Brooklyn-Queens Expressway”. The first time I ever heard of this road happened during 1990’s marvelous comedy Quick Change, in which some characters desperately seek to find that avenue. Quick Change was also the first time I ever heard of one Tony Shalhoub, who provided an extremely memorable performance as a cab driver. Spooky connection! The Siege offers a provocative and tense experience that kept me involved from start to finish. The movie examines serious issues but never does so in a dry or condescending manner as the package is wrapped in solid action/thriller elements. Add to that some terrific acting and you have a top-notch movie. The Siege appears in an aspect ratio of approximately 2.35:1 on this Blu-ray Disc. As a whole the film offered a very satisfying viewing experience. Sharpness seemed nicely crisp and well-defined throughout the film. At no point did I discern any signs of softness or fuzziness; this was a clear and detailed image. Moiré effects and jagged edges provided no significant problems, and edge enhancement remained minor. Source flaws failed to appear during this clean presentation. The Siege maintained a fairly subdued and icy palette, but within that spectrum, the colors looked clear and accurate. At no point did the film use any truly vibrant or lush hues, but the tones I saw kept within the movie’s domain and seemed very solid. Black levels also appeared nicely deep and rich, and shadow detail was appropriately heavy but never excessively opaque; contrast looked positive, and all low-light situations came across clearly. As a whole, the movie looked very good. The DTS-HD MA 5.1 soundtrack of The Siege was also quite strong. The film boasted a broad and engaging soundfield that always kept me involved in the action. Audio seemed appropriately and accurately placed within the spectrum and blended together neatly. Surround usage appeared very strong as the imaging cleanly engulfed me into a fairly seamless environment. The movie doesn’t contain any truly standout sequences, but the entire package seemed deep and engaging. Audio quality was very good. Some of the dialogue displayed minor edginess at times, but for the most part speech was crisp and distinct with no problems related to intelligibility. Effects were clean and accurate and they showed strong dynamics. Those parts of the film seemed clear and realistic and they featured no signs of distortion even at their loudest. The score was also bright and bold as it offered detailed highs and rich lows. All in all, The Siege presented a solid auditory experience. How does this Blu-ray release of The Siege compare to the quality of the prior DVD from 2000? Unfortunately, I was unable to directly compare the two. However, based on my prior notes, I’d think that both offer similar audio. The last DVD had a very good DTS option, and it likely compares favorably with this one. In terms of visuals, though, I’m sure the Blu-ray is a good upgrade. In addition to the standard increase in resolution the format affords, the Blu-ray lacks the minor source flaws I saw on the DVD. The Blu-ray looks great and is sure to impress fans of the film. In terms of extras, all we get are a few trailers. In addition to the theatrical trailer for The Siege, we find ads for Broken Arrow, Butch Cassidy and the Sundance Kid, The Edge and Flight of the Phoenix. That’s a shame because The Siege is a strong Blu-ray in all other ways. The movie itself is a provocative and compelling examination of the price of democracy. Despite the potential to become preachy, it always remains believable and exciting. The Blu-ray offers excellent picture and sound but includes virtually no extras. It’s too bad the producers of the Blu-ray didn’t use the opportunity to add some supplements, but the movie remains worth your time, and the presentation of it here works very well.